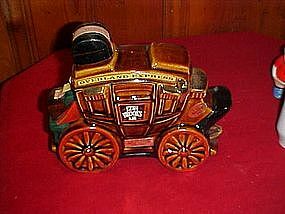 Ezera Brooks figural whiskey decanter in the shape of the Overland Express stage coach. Made of fine heritage china. Measures 7 1/4" tall and is in perfect condition. Made in 1969.